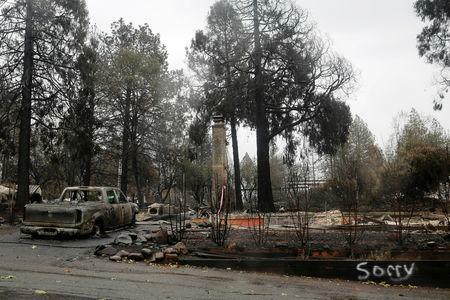 ​(Reuters) - The deadliest wildfire in California history that destroyed the mountain town of Paradise and killed at least 85 people was 100 percent contained on Sunday, according to state fire officials. 've noticed that the majority of news articles only mention the town of Paradise being destroyed, not mentioning the loss to Magalia and Concow residents. I also notice that most coverage praises the city of Chico for taking in so many evacuees which is truly admirable, but, rarely mention all the evacuees taken in by the town of Oroville as well as their animal shelter, in addition to the Gridley and Orland Fairgrounds. So many deserve praise and gratitude for their show of humanity. This tragedy has brought out the best, and the good, in people. As a Floridian and Hurricane survivor I feel for these people, this is tragic, I donated some money to help them and I hope it does. Stay strong! Electric company had reported sparking 15 minutes before fire started. Named “camp fire” because it was off of Camp Road. This fire causes me to think hard. One day you could be living in Paradise, the next day you might not be. Things can change in a moments notice. Be thankful for what you have today. Sending best wishes to my countrymen in California and elsewhere who have been enduring these natural disasters. Hopefully more people will contact family because they are alive. In the week of Thanksgiving, let us stop arguing and be thankful that some who were thought to be dead are alive. Any good news is welcome. I helped fire Depts and Rangers put out a "campfire" two weeks after the campfire had been put out. Was it a root fire or arson? Root fires can happen in dry areas, bogs, where the fire catches dried roots goes under the earth and erupts literally some days or week later. In bogs they can come up almost anywhere, in the fire I helped pout out, a fisherman was present and took photo of the fire erupting more than 20 feet in the air straight up a pine tree. In such cases you can not simply put out the fire you have to turn soil and keep dousing. We had humidity and a rain shower on our side and lee wind and it was next to a stream with water we could throw hoses into.. If someone did cause this fire with a campfire, they probably still don;t know they caused it, the person who set the fire I fought, made a good stone ring but did not give a thought to what was under the fire. It's good to read that they are finding many of the people claimed missing alive. Went from 475 to 249 NICE!!! Let's get it down to 100 by next week. Gee, you would think that there would be a toll free number or an email address especially for reporting that a person is okay and not one who may be listed as missing. problem solved. My kid always asking for a walkie talkie. Thinking about getting a good set with a good range. You never know when you just need it to communicate. Also wind up radios and flashlights in a bug- out bag. Electric company had reported sparks 15 minutes earlier. “Camp Fire” started off Camp Road. Even utility sounds like they are admitting probable fault. Check out a map. Paradise is far Northern California. Turning habitats into sanctuaries significantly alters the natural order to recover and replenish vital forage areas, called ground fires. What was once natural remediation, is now a man made tinder box of disastrous, uncontrollable crown fires. Pray for California. To say that they’re going through a very tough time right now is a major understatement. My condolences to the families of those lost. Hopefully more will be found alive. What role has California environmental policies played in these wild fires? Can a real journalist do a little research and report something meaningful? I visited The Grand Canyon yesterday and saw miniature fires sprouting up from different areas. Many people don’t realize that the sun hitting a quartz rock just right might cause a fire to flare up. Why don't these people who are displaced contact someone from where they are at? Shelters, friends, family, hotels, motels, should have someway for these people to make contact. CALL ANYONE WHO KNOWS YOU!!! They are worried about you. Lord, give the workers courage and strength to keep looking, and praying. Me I would like to know what a typical wildfire fireman makes while puttin out the fires and how much overtime is involved? A week ago the media was calling this the worst wildfire in American history, yet every day the number of those possibly killed shrinks. While it was a big disaster, the media had to make it look like the worst case scenario to get clicks and use the fire as a political weapon. Why isn't there a website to log in to report you've left your home and report yourself safe? This isn't that hard to solve. Millions of unharvested dead trees left to "preserve" nature destroyed so many lives and also wiped out the wildlife that was intended to be protected ! wow, around 25% of the town's population was 65 or older. That's a horrible place to have any sort of disaster strike. The is apart of agenda 21 heard the people into the big cities so the government can take the land! California is a test state to see how it goes before they roll it out to the rest of the countries. How many Trump supporters are raking leaves in the forest this weekend? Own a house in Cali for 10 years sell it and move to Texas and buy a house for cash, yeah tough Cali life. Wouldn't it have been easier if the missing list had just been published so people could notify the authorities that they were safe? Oh, wait, the higher number makes a better story! I don't understand .people in California if you see it's very dry be responsible when you start up your camp fire . we in TEXAS have a lot of woody areas you don't see as burning us out of your homes. it's a shame one person can cause so much harm and destruction . so sorry for the people that lost their lives . I GRIEF AND PRAY FOR YOU !! Not enough to sway an election but good start. So, no one thought of watch the news and contact authorities to find out if they were on that list? What I find most disturbing about the reports on the wildfire is most of them are wrong. There has been no official determination of how this fire began in a 15 acre area. And even though high winds and dry conditions are blamed for its rapid spread. People are trying to use the wildfire for their own political ideological ends, first for the midterms and now for climate change. According to the NY Times it may take months to sort out how this fire started. Root fires are also at work though no one seems willing to discuss it. My friends in the national park services note the numbers of rangers laid off, not on the enforcement side but because of eco friendly laws I am forced to ask by a former Forest Ranger who has tried to blame this somehow on President Trump, without a clear explanation, a ranger who made his living cutting fire breaks for 20 years heading crews etc. Why the state should continue to employ labor that is not allowed to do that job because of eco friendly laws that favor forever wild ideologies about the environment. We haven;t even begun to learn what caused this fire and why nothing was done or if anything could have been done to stop it. But it is something of a disillusionment when people are so bitterly and cynically resistant to asking the questions. David Hogg was nearly burned alive in this fire. He was last seen racing away with smoke coming off the tires of his lavender and pink Schwinn. He’s a survivor! And people should believe this, why? Truth is no longer part of the media. The people who blame this on Californians government are flat out wrong. It's climate change. These kinds of unprecedented fires are happening all over the United States like in Tennessee, Arizona, and Colorado Springs. Trump is bragging about the revised numbers of death is down. Try telling that to the family who lost a loved one. Even one fatality is too much to bear. I've been busy for a few days and hadn't looked at news... good to see the number of missing has dropped. I hope more are accounted for, but sense many have died and may never be found after rains wash away/bury remains and because some may have been cremated by the heat. Paradise had an easy warning about this 10 years ago, and it's one of many such areas where people can get trapped. Though conditions had to be "just right" for this to happen, all should come up with plans for evacuation - this was similar to so many structure fires where a high fatality count results from locked doors or not enough exits (e.g. The Station nightclub and Ghost Ship fires). There has been no official determination of how this fire began in a 15 acre area. And even though high winds and dry conditions are blamed for its rapid spread. People are trying to use the wildfire for their own political ideological ends, first for the midterms and now for climate change. According to the NY Times it may take months to sort out how this fire started. Root fires are also at work though no one seems willing to discuss it. My friends in the national park services note the numbers of rangers laid off, not on the enforcement side but because of eco friendly laws. I am forced to ask because a friend of mine a former Forest Ranger who has tried to blame this somehow on President Trump raised several contradictions Without a clear explanation, a ranger who made his living cutting fire breaks for 20 years heading crews etc. could not explain why the state should continue to employ labor that is no longer allowed to do that job because of eco friendly laws that favor forever wild ideologies about the environment. We haven;t even begun to learn what caused this fire and why nothing was done or if anything could have been done to stop it. But it is something of a disillusionment when people are so bitterly and cynically resistant to asking questions. Hopefully no more has died in the fires. CA now knows the difference between missing and unaccounted for. Next time survivors please check in with authorities that you are okay so valuable and tired resources will not waste time looking for your remains. We need to locate where the next camp fires are going to pop up and do some prevention work. The Santa Rosa fires and camp fire was a disaster waiting to happen. In both cases They cleared an area in a heavily wooded area and built houses out of wood. I don’t know the best salution but I do know that in Santa Rosa the grape vineyards acted as a fire break.That huge ball of wind aided fire was stopped in its tracks by the grape vineyards. Hopefully, California will invest in fire prevention instead of illegals and home ohs going forward. The biggest lesson in natural disasters such as these is that mother nature is always in the drivers seat. From fire to flood in a nano second, we humans like to think we have some control but we do not, never have, never will. What a HEARTBREAKING picture on the lead-in (not the one above); Paradise lost. By and large the media has not had a very serious discussion of the problems resulting in this disaster. People still can not have a serious discussion about the Wildfire in California too many people simply assume its global warming and have no idea what started the fire or why it spread so fast and will take months to put out and find point of origin. But everyone has an opinion probably based on eco ideology about it, people asking questions are more are how did we go from "question authority" to ideological bots? The people who are sending money can only hope it gets to the people who most need it hopefully they are getting help filing for individual FEMA assistance. I sure hope everyone missing is found safe. Some will get MAD about this . . . BUT . . . IF California would NOT spend $20 BILLION per year for ILLEGALS, maybe they would of had the extra money to spend on Fire Prevention Methods. These FPM cost money, but they do help control fires!!! Want more fires & death in your 3rd rate state of Mexifornia - elect Democrats who GIVE $20 BILLION per year to ILLEGALS!!! Prayers for the AMERICANS who have lost so much from this fire - - Because of ILLEGALS getting Fire Prevention money!!!! How many people left their pets home to die too? That's one of the real tragedies. Now, they are looking for them. If you do not consider your pet fanily, please do not get another one. You are what's wrong with our society. I wonder how many endangered species survived these fires? In California, the spotted owl is more important than humans. How would you know you are missing if you lost everything, you might still have your smart phone. You could see the news is looking for you, somehow you could alert authorities youre safe. Its nice to see these numbers go down. Hopefully all the missing turn up safe...especially with the entire population of 'Pleasure' missing as well, according to Donnie Dotard. Or maybe they are all out raking the forests. We just bailed out the utilities for the lawsuits generated over the last fire, and now we will do it again. This isn't capitalism. DO californacators realize fire after fire they are responsible for each life lost? When the same thing happens time after time the property being sold after loss of life is a crime scene. Shows you how blind all the clinton crime family supporters are. The same theft from the working class happens in wisconsin, lowlife elected making laws for friends corrupted by their own abuses. Yeah ... it's fully contained ... until next year when it happens all over again because California refuses to properly maintain their forests. Wow.. couldn't say North of Sacramento?? Had to say North of San Francisco... just say North of LA then. Everyone should have a list of what to grab in case of an evacuation and know where those items are. And since it is winter, here's a tip- tape bubble wrap to your windows when the power goes out. It doesn't look great, but your house will stay much warmer! The poll was conducted by DemocRAT Liberals. The timing and locations of the blazes is suspicious to me, coming so close to the elections. But if we get rid of all the undocumented workers, who is going to do all the raking? I'm so grateful that more people were located and are safe. I wish even more were safe, but I'm grateful for those who are. Well, that is some good news. Hopefully they will find the rest at different camps and shelters, or with friends and family. You know Canada has controlled burns; however, instead of only burning a few hundred acres at a time like we do in the US, Canada burns THOUSANDS of acres at a time. You have got to get rid of all that dead brush to control fires. Either allow logging or more controlled burns. I am 43 and I can remember in the 80s that US States would not burn much; however, I do remember a lot more freedom of logging and people being allowed to go into the National Forests more regularly to collect firewood. Remember logging just isn't about cutting trees for lumber it is also about cutting dead trees and brush for firewood. I was raised in Paradise and I can tell you it was a glorious place to live. We fished and hiked and enjoyed the smell of pine and the sound of the creeks as they made their mad dash to the river. The people were the most loving and decent people you could ever meet, it was kind of like living on Walton's mountain. Today I live in Chico and am thankful for that but in my heart Paradise will always be home and her people will always be my family. I have a feeling this post will be like a honey trap for the "fake news" crowd. These missing people were on the verge of leaving the state due to being taxed to death and screwed over by Sacramento Democrats that the fire was the last straw. Rather than continuing the agony, they probably just left the state of higher and higher taxes and expanding gov't and fires. So, how many of the so called "Hollywood Elites" have given anything to help out these people ?!?! These horrible fires are beyond comprehension. The lost of property, lives and those missing is devastating. Let's hope that the rains that are falling for aid the firefighters and they can quickly bring this event under control. I can't say thank goodness because 245 missing is still a terrible toll. To let people know their is a sight to put your name on to let people know you are safe. I lost my house but managed to sign up the following day so it's very simple! When you live in a dessert turned community and have a drought that = fire. Californians often brag about how they dont have to worry about tornados or hurricanes unlike say Texas, but unlike texas, they have to worry about fire because they only get rain during 6 months of the year and the rest is parch dry. The state and federal government is to blame for this, and PG & E! Something doesnt seem right about these structure fires. Homes dont burn all the way up like this. These fires arent natural. The metal and all is gone. Just doesnt happen like this. Paradise valley now looks like Tokyo after the big one fell on it years ago. A California play for Sympathy, to distract from their poor Forest Management. Why do people live in these places? I think mother nature is trying to get rid of California. My thanks to her. Good, but liberals should think of another way to clear and manage the forest. who didnt know the estimate wasnt typical fake news to sell ads ? Hey t'mp, the fire is contained; got'a RAKE ? ? ? PG&E negligence caused this fire, just like their negligence caused the 2010 gas line explosion in San Bruno. Heads need to roll. Very good news, it's contained. Since this most likely could have been prevented by proper maintenance that the environmentalists in charge blocked. I am wondering if they can now all sue the state? Most of the missing went back home to Mexico. Jeremiah 21:14 ► BIBLE PROPHECIES New International Version I will punish you as your deeds deserve, declares the LORD. I will kindle a fire in your forests that will consume everything around you.'" "Many did not know they were on the list" I guess they didn't have many friends or family either. 249?... What happened to the other 1,051? Or were they using a GWU Study? Just in time to put those in the caravan to work. I mean, they need all the help they can get with the clean up, don’t they?